The term, “citizen wealth,” was drawn from a book of the same name, Citizen Wealth: Winning the Campaign for Working Families, published in 2009 by Berrett-Koehler and written by Wade Rathke, founder and chief organizer of both Local 100 United Labor Unions and ACORN International, as well as ACORN in the United States before that. The philosophy of “maximum eligible participation” articulated in that volume also motivates the Citizen Wealth Centers. 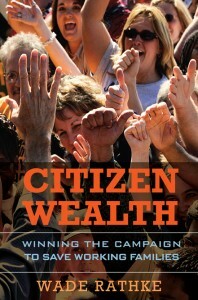 For more information or to purchase a copy of Citizen Wealth, you can do so through www.socialpolicy.org. Columbus Free Press: Tips and Tools #7: Building an Organization? It’s Hard to Run an All-Volunteer Army! Columbus Free Press: Tips and Tools #6: Building an Organization? Why Not Dues?